I was in awe on Friday when the eclipse darkened the skies. There was an eerie silence and the birds thought night had come. Although not a complete eclipse where I was, I was able to watch it on BBC via the Stargazing Live programme and was blown away by the technology involved in putting the programme together. Via our present day technology, the BBC had outside broadcasts from Cornwall, Leicester, Jodrell Bank, the Isle of Lewis, from the Faroe Islands on the ground and even from a small plane flying above the islands at around 25,000 feet so they could get the best view of all. All linked together via satellite and then beamed instantly around the whole country. "It was truly a beautiful sight to behold, even on TV!" Because of science, in part thanks to Isaac Newton and his understanding of gravity on celestial objects, we can accurately predict, over a period of the next 500 years, the exact moment an eclipse will happen, how much shadow each location on the earth will get during it and for how long. For this particular eclipse, in Cornwall, it was around 86% at 9.15am, where I was it was around 90% at 9:30am and as we moved further up the mainland and beyond, eventually to the Faroe Islands, we reached 100% before 10am. Shame the cloud cover was so variable across the UK on Friday. Some places got a great view, others not so much. It's incredible to think that only a few hundred years ago, people still associated eclipses with doom! Like the appearance of a comet in the night sky, a solar eclipse had people running for the pews and begging for forgiveness; much to the glee of the priests and the swelling of church coffers. Before that, in tribal Britain, clans would gather together and make noise to drive the moon away then celebrate the return of the light with a huge feast and the odd grateful sacrifice. And before that? Our Neanderthal cousins probably ran for their caves in terror not knowing what to think! Interesting how all the birds and animals just think it's night time again. Sometimes I wonder if we over think things, but to see the sun fading out during the day must have been quite frightening before we knew exactly what was happening between the Earth, the Moon and our life-giving star, Sol. I'm glad we live in this technological age. One of scientific freedom, of shared knowledge across the Internet and of curiosity to know more and more about the Universe around us. We even understand that in around 500 million years, the Moon will have moved away from us so far that we won't ever get an eclipse again! The Moon will simply look like Mercury or Venus do when they transit in front of the sun. But by then, we may be standing on a completely different planet and what will the sky look like there? 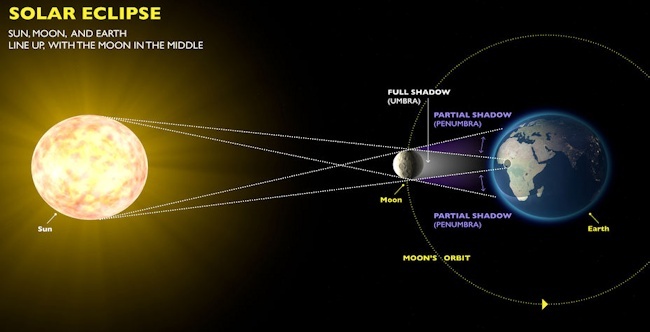 Will that planet's own natural satellites give us a new total eclipse, lost over time to the residents of Earth? I do hope so. "Could you imagine two moons completely eclipsing two suns at the same time? How amazing would that look?" A total solar eclipse can make you realise how small and insignificant you are, but also help you understand the physics of the Universe better. They truly are amazing things to see! I find it an amazing coincidence that the moon is 400 times smaller than the sun, but is 400 times closer, which is why solar eclipses can be total. What a time to be alive! PS ... I find it an amazing coincidence that the moon is 400 times smaller than the sun, but is 400 times closer, which is why solar eclipses can be total. What a time to be alive!